Atlantic Canada Beer Blogger (ACBB): How did you develop your interest in the history of Newfoundland Beer? Chris Conway (CC): Primarily it developed from my love of both beer and history. As long as I have been drinking I have had a desire to try every different beer that I could, which, in Newfoundland, wasn’t a whole lot. I’ve always been fascinated by the different beers with Newfoundland imagery that were available at corner stores and gas stations and how they all had very loyal cult followings. I didn’t really notice that these were local beers until I got away from the province, especially when I noticed (at a brew pub in Montreal – Le Réservoir) an india pale ale. It was the first I’d heard of the style, which was unheard of in Newfoundland (even though this was years ago, there are still no regular IPAs in Newfoundland)! After that I was curious why there was a beer in Newfoundland called “India Beer,” considering it had none of the same flavours. The idea sort of stuck at the back of my mind as I learned about more beer and travelled around other places. One day when I decided to search around on the internet for a definitive reason for the name of Newfoundland’s “India Beer.” To my surprise, there was very little in the way of an answer on the internet about Newfoundland beer except for a little postulation from surprised tourists (is this an IPA?!) and an article in the Newfoundland Liquor Corporations’ Occasions Magazine. Even more surprisingly, I found many comments from fans of particular brands that had no idea many of these Newfoundland brands were brewed by either Molson or Labatt. At that point my inner historian had enough and I started digging through archives and old magazines (along with bottle collections) to find some answers and to make the answers that I did find as clear and available as possible. ACBB: Tell me about your website. CC: The site was originally designed around a timeline that I put together from the Encyclopaedia of Newfoundland and my collection of Newfoundland beer labels. The main goal was to illustrate that many Newfoundland beers were owned by either Molson or Labatt and that, back before 1962, they had been products of three different independent Newfoundland breweries. As I kept researching I started a “research blog” where I added more old retired Newfoundland beer brands and pictures of their labels. Soon the research blog became the main site and I was researching everything from old brands to finding obscure advertisements . After I noticed a lot of traffic coming from international sources (largely people wondering what to drink when in Newfoundland), I decided to put a little “Newfoundland Beer Brands” post together which outlines which beers are owned by which big brewery now and to give them a little introduction to the craft beer scene in Newfoundland (including links to the three craft breweries Newfoundland currently has). I’ve continued to work on adding new content to the site discussing more interesting “breweriana” that I find and telling other historical stories. ACBB: Tell me about Newfoundland’s operating craft Breweries: Quidi Vidi, Storm Brewing and Yellowbelly Brewing. CC: I absolutely love craft beer and the craft brewing industry, so for the last few years I lived there I was a big champion of all three Newfoundland craft breweries. Every time I return home I try to drink Newfoundland craft pretty much exclusively, so I’m still a big booster for all three breweries. Quidi Vidi was always very close to home – literally it was only a few minutes from my parents’ house – so I always used to drink a lot of their beers. I loved them partially because they are tasty, partially because they are the only ones who sell widely available 6- and 12-packs of craft beer, and partially because if you buy them directly from the brewery you get a free dozen every fifth dozen you buy! They produce mostly beers that a fermented at lower temperatures (Lager, Light, Eric’s Cream Ale, and the legendary Iceberg which is made with real iceberg water), but they do have a few Ales including their Honey Brown and, my favourite, 1892. Storm is a little more elusive. I have a post discussing some of my thoughts on them, so I won’t go into much detail here, but they are the most North American looking of the breweries in Newfoundland. Storm is more an ale-focused brewery than Quidi Vidi. 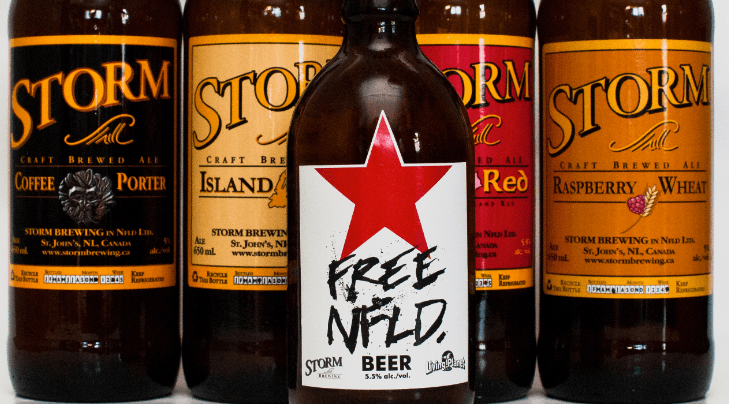 In recent years Storm hasn’t really made anything different from their four main brands (Irish Red, Island Gold, Coffee Porter, and Raspberry Wheat). Unfortunately their small production, lack of a visible brewery (it’s apparently in Mount Pearl somewhere), and lack of any social media presence make them a pretty elusive brewery to find out about! Their beers rotate seasonally, though I’m not exactly sure when either one of them is in season. They sell in 6-pack “long necks” and 650 ml “bomber” bottles. They usually deliver to the Liquor Stores and a few select corner stores on Thursday, and usually they sell out over the weekend, so sometimes finding their beer can be a bit of a chore. But often worth it! Finally, Yellowbelly is a relatively recent addition to the scene, acting as St. John’s brewpub and also doing some distribution to the Liquor Store. It’s young enough for me to remember going down as soon as they opened to try all of their beers! They have filled in some important gaps in Newfoundland’s current beer line-up. They make a stout, a light American-style wheat, a hoppy Pale Ale, and a red ale. That might sound pretty typical for mainland standards (especially by American ones), but prior to their opening these some of these styles were not really available anywhere in the provence (Guinness was the only stout and there were no real pale ales)! They sell larger format bottles at the pub, plus at some Newfoundland Liquor Corporation locations. Personally, I think that the brewpub is beautiful and certainly one of the nicer places to go for a pint in St. John’s (if not anywhere). ACBB: What would you describe as the most noteworthy events that took place in Newfoundland’s brewing history? CC: I guess I’ll go over a little of the timeline in four big events: prohibition, the 1962 sales, the beer strike, and the craft movement. Like most places, Newfoundland struggled with prohibition in the early 20th century, which closed out a good number of brewers like the Lindberg Brewing Company. The ones who survived did so by making “aerated waters,” basically turning the brewery into a soda making plant. After the prohibition experiment was over, three breweries, the Bennett Brewing Company, the Newfoundland Brewery, and the Bavarian Brewing Company, emerged as the big players and made some iconic beers (more on those later). The next big event was in 1962. In 1962 the big three Canadian Brewers, Carling-O’Keefe, Molson, and Labatt bought one of the breweries apiece and used them as their operations in Newfoundland. They kept on some of the old brands and brought in a few new ones. (See http://nlbeerhistory.com/timeline/ – linked already above – for more detail.) The the credit of Molson and Labatt, they still operated regional breweries in St. John’s to this day which keep brewing jobs in Newfoundland. So while the independent breweries did disappear the breweries themselves and the role they played in the community never did. The beer strike of 1985 is young enough to still be remembered by many Newfoundlanders and I’ve written it up on the blog. The short story is that one brewery had some labour issues which prompted the other breweries (not the other unions!) to lock out their workers. This lasted so long that the government had to import American can beer, which most Newfoundlanders hated. When the strike eventually was resolved the cheep American beer was sold off. I think that the beer strike had an impact on the tastes of Newfoundlander’s, who to this day often prefer lighter tasting beer, but I can’t really prove it! The final noteworthy event is in 1996, when both Quidi Vidi and Storm started brewing beer. For the first time in many years beer was brewed independently in Newfoundland which, for most nationalistic Newfoundlanders, ought to be a point of pride. I’m pretty sure the history of most of North American beer is reflected in Newfoundland – through the prohibition movement, the consolidation of the big breweries, and the emergence of craft beer – so I think it’s an interesting for anyone interested in beer history and the craft beer movement in general to look at Newfoundland as a reflection of the broader trends. ACBB: Tell me about some of the brews created by macros that are exclusive to NFLD. CC: I’ve got a post about this, but I’ll summarize it here. Molson inherited India Beer from the Newfoundland Brewery and Dominion Ale from Bennett Brewing (it’s still sold as Bennett Dominion Ale). Molson also inherited Black Horse, a Newfoundland favourite, from another brewery – but not a Newfoundland one – it was a Carling-O’Keefe brand. I’ve written a fair bit about Black Horse largely because its so typically associated with Newfoundland, but is really a beer dating back to 1811! Black Horse and India Beer were the beers that I used to see the most at concerts and both have a fairly strong following in the downtown scene. The Molson brands are more obviously Molson brands because they use a simple Molson cap for the bottles! The Labatt brands, Jockey Club and Blue Star, both came from the Bavarian Brewing Company. Blue Star is another cult favourite, though, from what I’ve noticed, it’s more of a rural (“out around the bay”) beer compared to the urban (“un past the overpass” – St. John’s) India and Black Horse. Each of these five beers has a following, though, honestly, in a blind taste test (I recently did two!) it’s really quite hard to tell them apart based on appearance or taste. There was another brewery on the western part of the island – it had several names over the years – that you can find out more about in this post . ACBB: What would you describe as the major differences between NFLD beer culture and the mainland (bottle shapes, tastes, etc.)? How has Newfoundland beer culture changed over the years? CC: The first thing most people notice when they come from the mainland is our shorter-neck bottle. I’ve gotten so much traffic on my blog from people looking for the answer to that question I’ve written up a short history. Taste-wise most people from the mainland who know beer (beer geeks, nerds, snobs – whatever) seem to be pretty disappointed when they see the range of beer options available in Newfoundland. Even the craft breweries tend to be a little timid when approaching Newfoundland’s historically very limited tastes in beer. There aren’t many flavourful beers here at all, even compared to the rest of Canada, and none of it is exported outside the province. Newfoundland’s beer culture has always been a little more “functional” than most other parts of the country, so taste is having a little renaissance here now. I was very happy to see Quidi Vidi make an British IPA this summer, the first IPA to be made commercially in the province for many years (there aren’t even any imported IPAs from other places in Canada or the US), and that Yellowbelly has really started to try making styles in their seasonal collection that are usually not seen in bars around (a Hefeweizen and a “Ginger” Ale, an Irish Red with Wild Yeast – no ginger). In Newfoundland’s past, English-style stouts and porters used to thrive, so it would be nice to see more historical English influence back in the province and, with the craft beer boom in the United States slowly propagating thorough the bigger provinces now, I’m hopeful that some more American-style IPAs and ingenuity will be soon either imported or, preferably, brewed in Newfoundland. It’s time to get some hops on the rock. ACBB: What NFLD beers do you miss most while in Toronto? CC: Newfoundland beers are a little bitter-sweet for me now that I’m in Toronto. I think it’s important to support the three Newfoundland craft breweries, but, with access to more Canadian, European, and American breweries in Ontario, the beers that are in Newfoundland feel a little tame by craft standards. 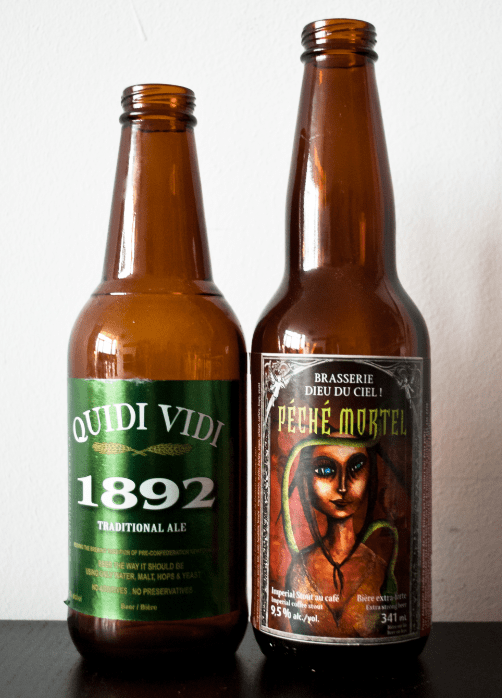 I do miss Quidi Vidi’s 1892 and I always try to keep a small stash of it in my fridge up here. 1892 was the year of the St. John’s fire where most of the town burned down and Quidi Vid has kept with that historical note in brewing it with the ingredients that might have been available at that time (English Malts and German Hops – Saaz if I remember correctly). It’s a really unique beer and really a taste of home for me. The Duke’s Own is another one that I really miss, but part of that is likely that I miss drinking pints of it with friends and family at the Duke of Duckworth. The Duke, now famous for its staring role on the Republic of Doyle, used to brew it themselves but now have Storm brew it for them. It’s really one of the best English Ales to have never been served on cask! ACBB: You’re a home brewer; tell me about the home brewing scene in NFLD. CC: Most people that I know who homebrew in Newfoundland do so in large part because they cannot get many different styles of beer locally. A selection of stouts and Belgian-inspired (doubles, triples) beers are pretty much impossible to get in Newfoundland (though some of this might be changing with the “Beer Thief” ordering club ). For IPAs or even a hoppy pale ale, well, there you’re out of luck. So, for many folks, home brewing is the only option (aside from the occasional smuggled Boneshaker IPA or Twice as Mad Tom DIPA from Ontario). Fortunately, St. John’s has two locations of a great local brew store, Brewery Lane (they also run a web store ). Both locations are excellent sources of hops, malts, equipment for brewing, and, most importantly, good advice. I’m not aware of any brewing clubs in Newfoundland outside of my circle of friends, though they likely exist given how quickly certain varieties of hops sell out at Brewery Lane. For my part I’m looking forward to my trip home at Christmas to try some of my friends’ newest brews and to try out a collaboration brew I made awhile back with a friend for Christmas: a chocolate clementine imperial stout. ACBB: Do you have any plans to work in the brewing industry after graduating and if so in what capacity? Do you plan on returning to NFLD to work? CC: This is what everyone’s been asking me since I’ve started this blog! Lots of people, when they notice that all I ever talk about is the current Ontario beer scene, the history of Newfoundland brewing, and home-brewing, start to wonder why I’m not in the industry. Honestly, right now it’s really hard to say what my plans are. I really do love my “day job” research and I’m really passionate about continuing it. But, where history is one of those fields where job competition is tight and job openings are few and far between, I like to keep my options open in many different directions. I have a running fantasy of opening a small (American influenced) brewpub in St. John’s to make some big, exciting beers there, but that’s -really- just a fantasy at this point. For now, brewing history is a big passion of mine that fits well with both my academic and brewing interests. Plus, I’ve still got big backlog of material, “new” old labels, and topics that I’ve been working on getting blog posts written about. The history of brewing is pretty underdeveloped as I see it and the beauty of academic freedom is that I can continue my professional research and researching brewing history at the same time. For now I’m really happy with remaining a part of the consuming and enjoying side of the beer industry. Thanks for the questions and the interest in Newfoundland’s Brewing History! Newfoundland Beer History also has a Facebook page and Chris has to Twitter accounts: a personal account ( @groulxsome ) and one that provides updates related to the blog ( @NLBeerHistory ).